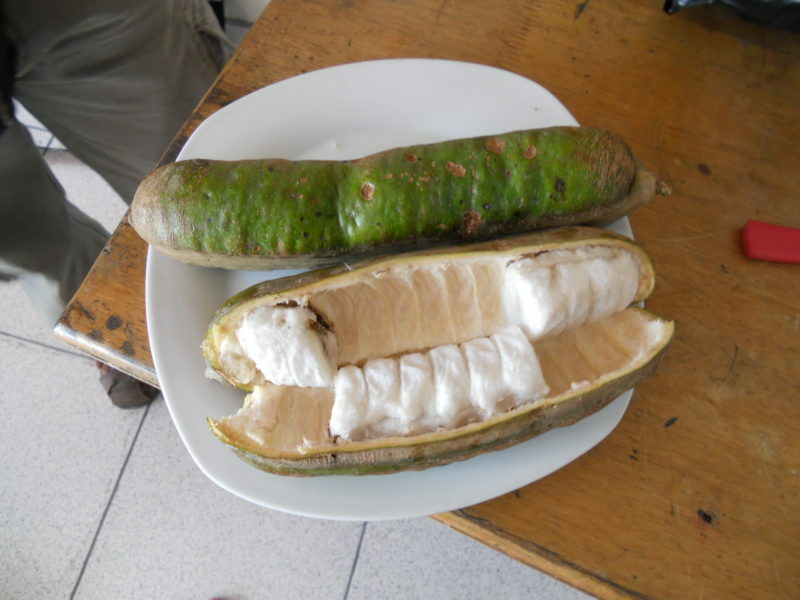 The white stuff around the beans of the Inga marginata is edible and very popular in South and Central America where it originated. It is also called Ice cream bean. I took some of those Inga marginata seeds back to Thailand and properly planted them. This Inga marginata tree is about five years old and seven or eight meters high. My Guabilla tree grew quite fast and flowered twice already, but unfortunately we could not harvest any fruits yet. 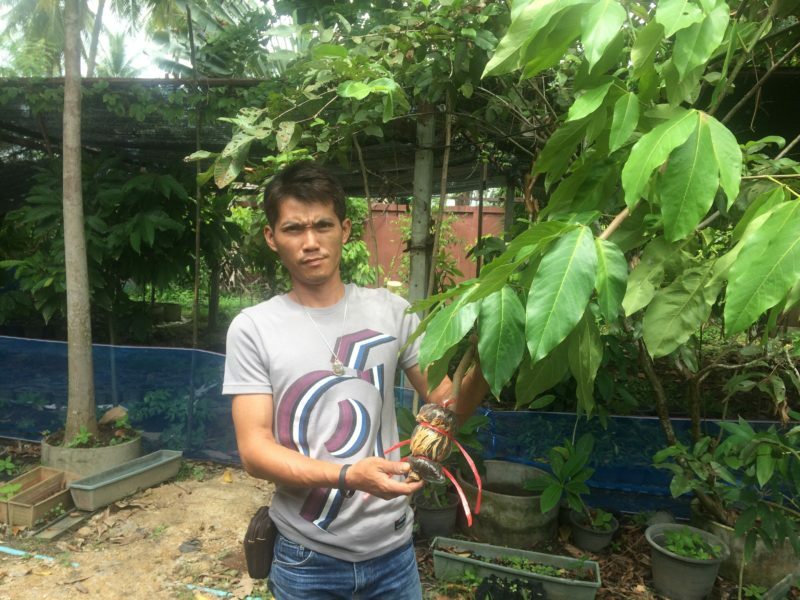 Therefore we had no seeds available for propagation in Thailand or Laos. On my latest trip to Colombia I found some seeds of Inga marginata, brought them back to Thailand, planted them, but a squirrel must have eaten them. It took only a few weeks to air layer our large Inga marginata branches. The Guabilla branches root quickly. The branch of the Inga marginata tree is then potted and we have gained an identical plant or clone. 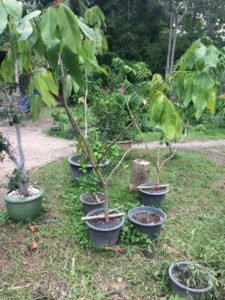 A new Inga marginata tree is created. We have just made six more Inga marginata trees which are for sale in Thailand or Laos. 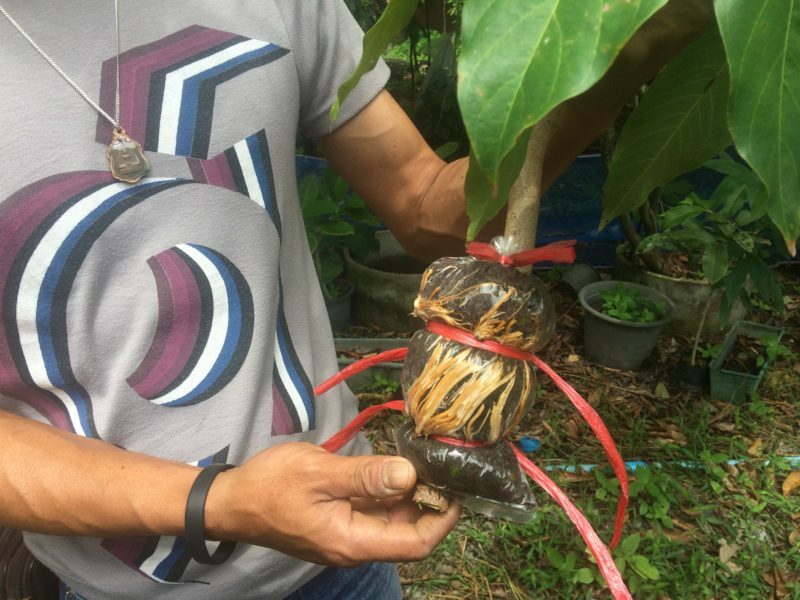 The advantage of this method of propagation: You get tall, mature new Inga marginata trees that can bear fruits immediately and beautify your whole garden with their beautiful leaves as well. We have a small (hobby) coffee farm near Thatheng in Sekong province, Laos. I saw some intercropping on a coffee farm in Indonesia last month, using vanilla, cacao, cinnamon, and thought this was an interesting option. I later saw growing of nutmeg and cloves in what must be a similar climate to Laos. When I looked on the net for a source of trees in Thailand or Laos, I was frankly shocked to see your nursery/garden just across the river from us in Vientiane. generally about 10 degrees cooler than Pakse on the plain, 80 km away. I will travel to Singapore Sunday, then fly to Phnom Penh, up the Mekong to Pakse and should arrive in Nong Khai about November 8th. If you want to visit me then, or around that date better, this would work out. Please tell me what plants you are interested, so I can make sure, we have them in Nong Khai. I have attached a price list. one of those trees is 1200 Baht and transport should be about 400 Baht. I have also attached a price list which covers most of our plants.